During the SERVIR E&SA Consultation and Needs Assessment Workshop conducted in Kenya in August 2016, low crop productivity was identified as the major problem. This is influenced by climatic conditions such as droughts and flood coupled with unpredictable rainfall due to climate variability; and changing temperatures which has resulted in poor yields. 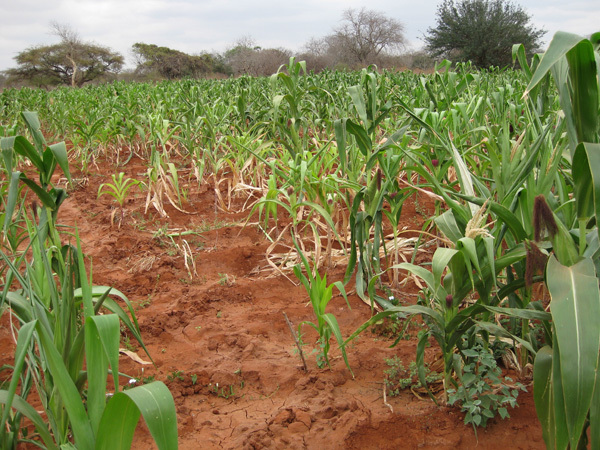 Climate variability coupled with over-reliance on rain-fed agriculture on smallholder farms with pressure to feed a rising population on already strained land that is facing degradation and declining soil fertility; highly impacts food security in the Greater Horn of Africa region. The Government of Kenya has implemented a Crop Insurance program to shield farmers from the unpredictable climate by providing payouts during incidences of crop failure. However, the implementation of the program is facing various challenges such as lack of reliable yield trends at sub county levels and lack of a cost effective sampling frame that can be implemented to identify farms to be sampled for yields assessments. The State Department of Agriculture (SDA) was using a tedious, costly and time consuming method of listing all farmers within a Unit Area of Insurance (UAI) at sub county level. These challenges were identified during a follow-up stakeholders’ engagement that was conducted in collaboration with the AST II team from University of Maryland (UMD) and State Department of Agriculture (SDA) in 2016. At the regional level, through the Greater Horn of Africa Climate Outlook Forum (GHACOF) that is held quarterly pre-season and spearheaded by the ICPAC, a consensus climate outlook is developed for the IGAD region. However, the implication of the seasonal forecasts and subsequently impact of seasonal weather on the agricultural (particularly crops) performance which is critical in the IGAD region, are usually not fully analyzed and the implementation of the IGAD region crop monitor and capacity building of focal points from the IGAD region would fill this gap. SERVIR E&SA has been engaging key stakeholders such as Famine Early Warning Network (FEWS NET), Department of Resource Surveys and Remote Sensing (DRSRS), Ministries of Agriculture, SDA in the Ministry of Agriculture, Livestock and Fisheries (MoALF) in Kenya and ICPAC who are some of the key players in producing, contributing or disseminating food security data and information at different administrative levels. Another potential stakeholder is the National Drought Management Authority (NDMA) and national and regional level. The overall objective of the service will be to develop tools for crop conditions monitoring, support implementation of the crop insurance program by developing the sampling frame, and build the capacity of stakeholders to use the tools.